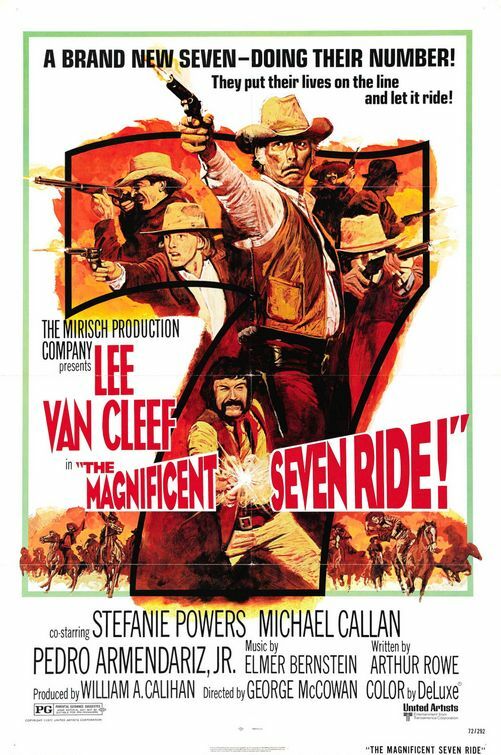 Probably the darkest and most cynical of the four movies, 1972’s “The Magnificent Seven Ride!” comes undone by a number of things. For starters, there’s the apparently very cheap budget which affected the sets, the story, and surprisingly enough, the musical score from composer Elmer Bernstein. Ah, who knows? Maybe the studio thought adding an exclamation point in the title (didn’t they “ride” in the last three movies as well?) would fix all those problems. Close, but no cigar United Artists. So, before we see another Magnificent Seven incarnation ride into theaters this weekend, let’s take a look at the last of three sequels to the original. A good place to start is with the screenplay by Arthur Rowe (who had written the screenplay for “Zeppelin” the previous year and then went on to write episodes for “The Bionic Woman” and “Fantasy Island”), who basically takes two stories and splices them together, hoping they’ll work together just fine. Well, if two movies were to be made from this screenplay, we might have had two good separate movies, or at least two hour-long TV shows. But of course, that might be too easy to do. My main issue though is simple, this new Magnificent Seven aren’t even introduced as a group until an hour into the movie. Say what you want about the first three movies, but Chris Adams in any one of his forms was putting together each group of seven within the first fifteen or so minutes. Not here, which starts a completely different storyline, even before getting to a new group of specialists. 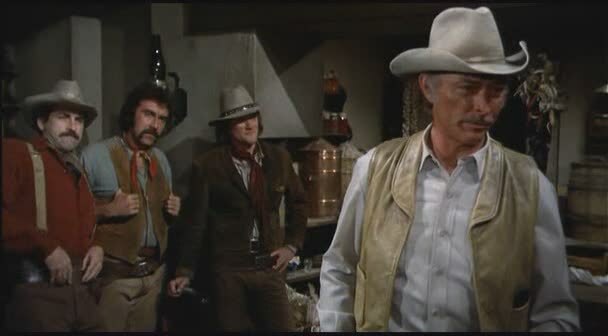 Now with a badge on his shirt, Chris Adams (hullo, Lee Van Cleef) is a marshal in a small western town with a new bride, Arilla (Mariette Hartley). Chris has built himself up quite a reputation as a tough law officer, but his wife convinces him to let go of a young prisoner she believes made one bad mistake. He does, but the boy joins a gang and during a bank robbery, they kidnap Arilla and ride out. Chris is joined by a writer, Noah Forbes (Michael Callan) who’s out to document his heroics as they head out after the gang, only to find Arilla raped and murdered and the trio of youngsters split up. Out on the trail looking for them, Chris meets an old friend, Jim McKay (Ralph Waite, later known as Pa Walton on “The Waltons”) now a sheriff, who is trying to stop a bandit named De Toro (Ron Stein) and his gang from attacking their town. Chris declines the invitation to help, and it’s not long before the friend and his posse are shot down. 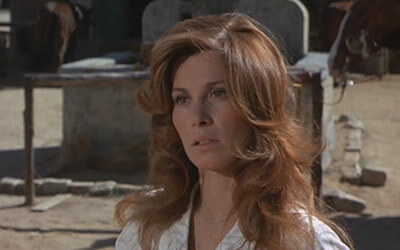 Feeling guilt for what he chose not to do, Chris finds the town, sans men, now occupied by just the widows, including Stefanie Powers (with some big 70s hair too) with the gang’s return seemingly imminent. With no other option, Chris and Noah recruit five prisoners from the Tucson Territorial Prison (think crappy “Dirty Dozen” story) to help them defend the town. 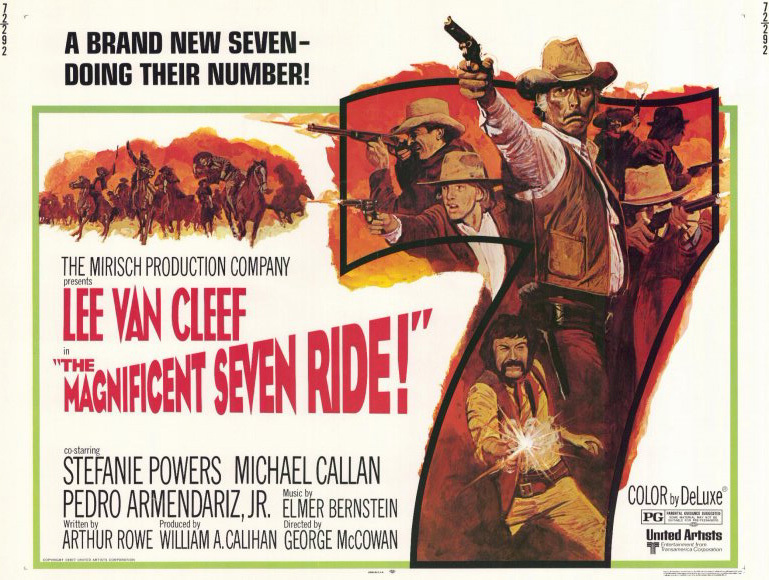 Van Cleef is an interesting choice to replace Yul Brynner and George Kennedy as Chris. A huge star due of his success in Europe, Van Cleef brings an edge to the character we haven’t seen before. After losing his wife, he plans out the town’s defense like a suicide mission fully expecting to die in the process. An interesting twist on the character, for sure. In the quasi-McQueen sidekick part, Callan plays Noah as a whiny, cheap writer who questions Chris’ actions, only to – gasp! -come around in the end. It could have been a cool character to add to the mix, but Callan comes across as just plain annoying. As for the rest of the seven, the biggest change here is they’re all convicts. This seems like an easy way to keep the story moving by taking an idea from a different movie. Making it worse, none of the five convicts are developed much at all. 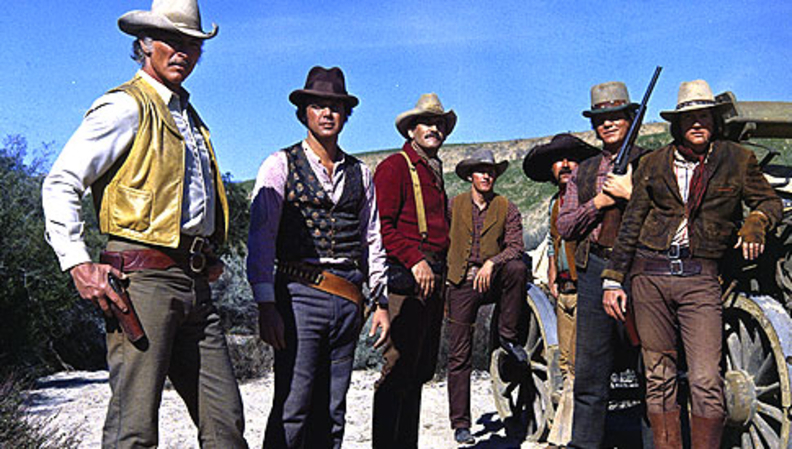 There’s Skinner (Luke Askew) and Pepe (Pedro Armendariz Jr.), two gunfighters who’d like nothing more than kill Chris, Walt (William Lucking), the strong, silent type good with a shotgun, Hayes (James Sikking), a former Confederate officer adept at planning battle strategy, and Elliott (Ed Lauter, in his movie debut), the explosives expert. The only ones making much of an impression are Askew and Armendariz, more so because they act cool than any sort of development they have. In the original movie, Eli Wallach’s Calvera is introduced, disappears for an hour and then returns with a vengeance late. In “Ride!”, the lead bandit has one line the whole movie (a classic delivery of ‘Vamanos!’ if you ask me) and is played by acting powerhouse Ron Stein, a stuntman known for his parts in the “Planet of the Apes” TV series as ‘First Gorilla.’ The villain is totally wasted here and not a presence at all. Another test of how good/bad movies can be is the groan test. How many times watching the movie do you groan at some cheesy line, horrible special effect, or set falling apart in the background? This one has its fair share including my personal favorite, “I, Chris, degrade your woman!” in a message to Stein’s De Toro character. Also, the widows left in town were gang-raped by De Toro’s men and just found out their husbands are all dead. They sure cozy up to these new men awful quick, including Chris (wife raped and killed) snuggling up with Stefanie Powers (gang-raped, husband murdered, has to care for children…) days after all the bad news hits. Now that’s a good script. Besides the lack of a good story, the film has the look of a made-for-TV movie because it was filmed in the Hollywood backlots on a variety of generic looking sets straight out of “Gunsmoke”or “Bonanza”. The positive to take away is the final battle as De Toro and his men finally attack the town, but even then it’s a measured positive. We know little to nothing about these men, but are supposed to feel something for them when they begin to drop like flies? Yeah, good luck with that. A disappointment all around and a sorry end to the four “Magnificent Seven” movies.